Love it or hate it, 4K video is all the rage and YouTube is the second-to-none place to watch them with tons of 4K videos at 60fps. Streaming 4K video can be much too network-demanding and bandwidth-consuming. Comparatively speaking, a better option goes to download 4K video and play them with a 4K video downloader. Speaking of 4K 2160p video downloader for 2019, almost everyone is itching to find out the best one that is suitable for him and can meet his specific needs. Since everyone has different demands on the video downloader, it's seemingly impossible for me to list out all the sorts of 4K video downloader to satiate your taste. It's quite sensible to introduce an all-inclusive 2019 4K UHD video downloader, from which you guys can find the feature you care about most. Based on the feedbacks on the forum, the aspects of a video downloader you guys highlight are: ease of use, fast speed to the utmost, 100% clean and multifunction. Wow, how high-demanding you are! Many a normal Ultra HD video downloader has quitted like Keepvid, Video DownloadHelper, 4K video downloader, etc. in consideration of their imperfection. Does this mean no one is born with multiple purposes? Don't be silly! Just as the saying goes, only unexpected, not impossible. 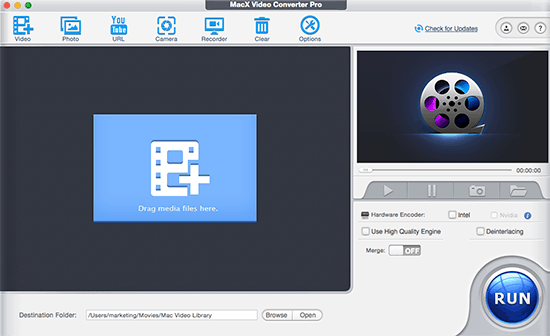 The world-renowned MacX Video Converter Pro is beyond your imagination, which can achieve all your goals setting for the best 4K video downloader. Best 4K (UHD) Video Downloader - Download 4K VR 360 Degree Video Easy Fast and Clean! 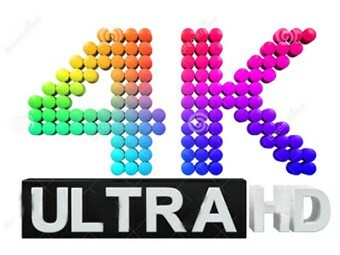 First of all, this best-ever 4K UHD video downloader can seriously download any 60fps 4K video from YouTube, no matter the 4K VR movies, 4K samples, music videos in 4K UHD, or 4K TV shows, it can seamlessly download 4K Ultra HD VR video from YouTube just a click away with world's fastest speed thanks to the advanced Intel QSV/Nvidia/AMD hardware acceleration tech, multi-core CPU (up to 8) use and hyper-threading tech. Famous for its self-contained feature, this 2019 top YouTube 4K VR downloader is able to accomplish the 4K video download task all by itself without any third party or plug-ins involved so as to guarantee a 100% clean yet secure downloading environment. How easy and fast this 4K video downloader works? Just see the tutorial and give it a try, then you will get it! Best 4K Video Downloader: How to Use it to Download 4K UHD Video from YouTube? Step 1: After free downloading and launching this 4K content downloader, click the button "YouTube", and you will see the pop-up window. Put the target YouTube 4K/60fps video address in the address bar and click the button "analyze". Or you may click the button "paste & analyze" to let the software detect the YouTube video automatically. Step 3: Click "Download Now" and start downloading 4K VR video from YouTube. Just several mins later, your 4K/60fps video will be downloaded from YouTube with untouched quality. Successfully downloading 4K movie video from YouTube is all you demand? Not really, I bet, for the majority of guys are eager to transfer the downloaded 4K content to iPhone iPad Android for on-the-move watching. But we all know that the 4K video downloaded from YouTube are usually formatted with FLV, 3GP, MKV, AVI, which are the video formats rejected by mobile devices especially Apple iPhone iPad. In such circumstance, what you need to do is to compress convert 4K video to iPhone iPad Android compatible format and resolution. 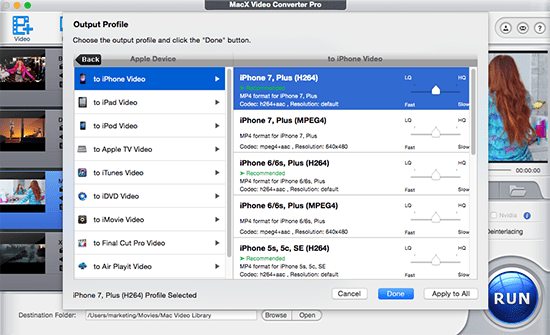 Needless to look around, MacX Video Converter Pro fits the bill, with its inherent 350+ preprogrammed profiles offered for you to compress and convert 4K movie to iPhone X/8/7/6s/6, iPhone Xs/Max/XR, iPad Mini 4, iPad Pro/Air 2, Samsung Galaxy S9 edge/Note 9, HTC 10, Surface Pro 4, PSP, PS4, Kindle Fire, Xbox One, etc. with zero quality sacrificing due to the support from High Quality Engine. * Function as a screen video recorder to record on-screen activity such as record a video game walkthrough, capture non-downloadable videos and record iTunes DRM video, etc. * Play the role as the top slideshow maker to transfer a collection of photos to a vivid slideshow video with music for sharing with friends. * Work as a 4K video editor to clip 4K UHD video to get your desired video segment, crop frame size to remove the unwanted black bars, merge video clips into one, and add watermark or subtitles to customize your video, etc.